Luigi Chinetti (July 17, 1901 – August 17, 1994) was an Italian-born racecar driver, who emigrated to the United States during World War II and became an American citizen. He was a driver in 12 consecutive 24 Hours of Le Mans races, winning 3 times, and also won the Spa 24 Hours race twice. He was the long-time American importer of Ferrari automobiles to the United States. Born in Jerago con Orago, north of Milan, he began work for Alfa Romeo as a mechanic in 1917 at the age of sixteen. The rise of fascism in his native country prompted his move to Paris where he worked for Alfa Romeo as an automobile salesman and became a sports car driver. Driving an Alfa Romeo race car entered by his co-driver Raymond Sommer, Chinetti won at his very first 24 hours of Le Mans race in 1932. The following year, with Louis Chiron as co-driver, he won the Spa 24 Hours endurance race in Belgium. He teamed up with Philippe Étancelin in 1934 to win his second 24 hours of Le Mans. Following the outbreak of World War II in Europe, Chinetti initially went to the United States of America with Dreyfus from the Ferrari team, for the 1940 Indy 500. He remained in the U.S. during the war, working for the Italian dealer, importer, and master mechanic, Alfred Momo. Luigi Chinetti became an American citizen in 1946. With the war over, racing resumed in Europe and he entered the competitions. At the 1949 24 Hours of Le Mans race he drove the first Ferrari ever to win the event, and became the second three-time winner of the race. The Ferrari 166M in which Chinetti won was turned over to Baron Selsdon of Scotland (Peter Mitchell-Thomson) for twenty minutes during the race, making Thomson the official co-driver although Chinetti had driven twenty-three of the hours of the race. Following the race, Thomson purchased that automobile through Chinetti. That same year Chinetti won his second Spa 24 Hours, this time driving for Ferrari with Jean Lucas. In 1951, he was the riding mechanic in the Ferrari 212 that won the grueling Carrera Panamericana race, a 2,100-mile (3,400 km), five-day competition across Mexico. Driving the automobiles of more than one manufacturer, Luigi Chinetti competed in every Le Mans motorsport race held between 1932 and 1953; he entered an automobile in the 1954 race, although he was not a driver. Enzo Ferrari appointed Chinetti as his Ferrari factory agent in the United States. Chinetti opened the first—and for a while the only—Ferrari dealership in the country. Later his territory became all areas east of the Mississippi River. The tradition associated with Chinetti continued to draw clients from all areas throughout his career. In addition to handling Ferrari, Chinetti Motors was also U.S. agent for Automobili OSCA of Bologna until 1967. The showroom of his Greenwich, Connecticut business remains open, owned by Miller Motorcars, a Ferrari-Maserati dealership. The first sale Chinetti made through his Ferrari dealership was sold to Briggs Cunningham for racing, which ultimately ended up in Cunningham's motorcar museum. Most of the sales Chinetti made were, however, kept secret to protect the privacy of his wealthy clients. Chinetti also was the founder of the North American Racing Team, an official arm of Ferrari. It became the team that established the high ranking of Ferraris in American racing circuits, and largely, was responsible for Ferrari's survival as a retailer of cars through the quantity he sold to wealthy individuals in North America. The team, sometimes abbreviated as N.A.R.T., also had a very successful endurance racing program both at Sebring and at Le Mans, right into the 1970s. In addition to the racing cars, the team commissioned many limited-run special variants of Ferrari road cars, most notably, the spyder version of the Ferrari 275GTB/4. 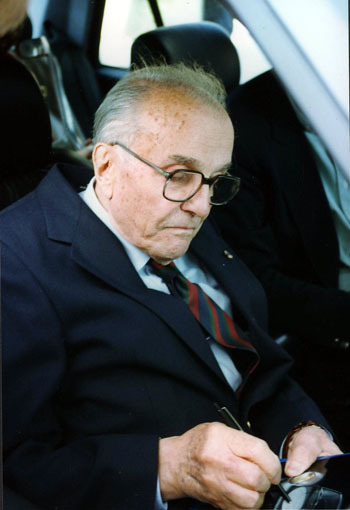 Chinetti remained in Greenwich, Connecticut after his retirement and died in 1994 at the age of ninety-three. ^ Siano, Joseph (August 20, 1994). "Luigi Chinetti Sr., 93, Automobile Importer and Champion Racer". nytimes.com. The New York Times Company. Retrieved April 15, 2017. This page was last edited on 31 December 2018, at 12:13 (UTC).